HOW MUCH IS YOUR FAVORITE SPORTS BLOG WORTH? Juiced Sports today has a list of the Top 100 Most Valuable Sports Blogs. 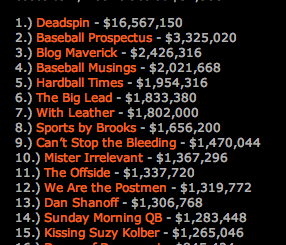 According to the site, www.deadspin.com has the highest value. It’s worth more than $16 million. You are currently browsing the archives for the sports blogs category.